Availability: This product, size or option is out of stock. This Kubotan Defense Tool is designed with finger grooves that allow you to get a really good grip and use it as a pressure point weapon. This model is available in a black & white finish. It is 5 and a half inches long and made of strong aircraft aluminum. If you've ever felt threatened walking alone down a deserted street or entering your apartment late at night, you've probably considered some form of self defense class. Many people also believe buying a firearm is a good solution to their fears of attackers. Yet what if you had a small piece of metal that could save you in the event of an emergency? The Kubotan may be the right answer for you. This small stick that is known as the Kubotan is used as a pressure point weapon. It can be used to deliver a painful blow to an assailant. They are extremely easy to use, and nearly anyone can be trained to use one. This one is made of aircraft aluminum and looks like a simple keychain to would-be attackers. This tool was invented in the 1960s by Takayuki Kubota in Japan. It is a trademarked brand of self-defense weapons. This small stick was based on the koppo stick, yawara stick or nightstick. The general idea is that the would-be victim can use the small piece of metal to hit, stab or maim an assailant. Kubotans are extremely popular because nearly anyone can use one. They gained popularity in the 1970s when the NYPD began encouraging female officers to use this pressure point keychain on criminals. They make a great choice because you don't have to seriously injure your assailant, yet you'll cause a lot of pain. And you'll induce enough of it to escape your attacker and seek help. These small weapons are also extremely discreet. They can fit in your purse or pocket and also serve as a keychain. These small and discreet sticks are generally five inches long and they come in a variety of colors and shapes for different techniques. Some of these sticks even come with built-in flashlights. They come with grooved sides and small ridges that can be used to screw the Kubotan into an assailant's groin or eyes. They always come attached to a small key ring that doubles as a keychain. This can help keep the Kubotan discreet and undetected to assailants. 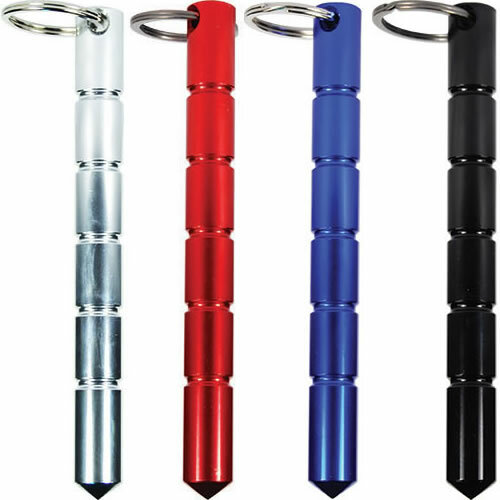 Most attackers simply thing the small stick is a keychain and won't expect most victims to use the piece of metal as a self defense weapon. The Kubotan can be used in a variety of ways. Users can be trained to use this small weapon in a way that works best for them. The biggest mistake people make when using this tool is to try to be too precise. Yet the tool was created for a natural "knee-jerk" reaction. Simply use the small piece of metal to hit some of the parts of the body that are easy to reach. Some of the best body parts to target include the groin, throat, shin, hip, ankle or kneecap. Any body part that is extremely hard or fleshy can be an ideal target. These places can elicit the most pain in your assailant. The eyes are also fantastic targets. Just like many women are trained to gouge out eyes or the mouth of their assailant with fingers, the Kubotan can easily attack these areas too. The Kubotan can be struck against bones. This type of movement can actually break a bone if swung hard enough. It's best to aim for areas of the body that are not covered in clothing. In the winter, it's best to aim for eyes or the face since most assailants will be covered in heavy clothing or thick coats. Aiming for exposed skin is the easiest way to deliver a painful blow. Don't overthink the Kubotan. This tool was created for natural use. You don't need to be precise or extremely strong to protect yourself from predators. Simply aim for the closest body part. If the attacker comes at you from behind, this may be stabbing the Kubotan into the groin or slamming it against the knee. There's no wrong way to use this powerful tool. Just do whatever feels natural and easy. You might even get a small stab or hit in before your attacker's grip loosens. At this point, you can gear up for a more intense blow before getting away. The most important rule to this type of self defense is to resist the urge to be timid. Your attacker isn't going to be timid about hurting you. Carry your Kubotan with you at all times – especially at night. Keep it in your palm as you're walking to your car or into your apartment. There's absolutely no reason for a stranger to approach and touch you. If you feel threatened, don't be afraid to defend yourself. Some also come in the forms of pens or flashlights, so you can use them for practical purposes too. The keychain version comes in handy because you generally hold your keys while walking to your car or apartment at night. Above all, make sure you're comfortable with your Kubotan. Watch an instructional video, or take a class designed to teach you how to use this weapon. If you don't feel comfortable with it, you won't be able to defend yourself in an emergency. We also carry a model with no finger grooves as shown below. Click the picture to be taken to that page. Good grip, easy to fit on key ring. Solid construction. Looks very effective for men and women in a crisis situation.